Courtyard of the Palazzo Brera. The name “Brera” apparently derives from a Germanic word, braida, which means “field of grass”. In this part of the city of Milan, traditionally home to many artists, we find the world-famous Pinacoteca di Brera. It can be found in a palazzo that was built for the Jesuit Order in the sixteenth and seventeenth century. The Jesuits turned the Palazzo Brera into a cultural centre, which included a prestigious school, a library and an astronomical observatory. They received support from the empress Maria Theresia of Austria, and when the Jesuit Order was disbanded in 1773 by pope Clemens XIV, the empress founded the Accademia di Belli Arte three years later. A museum for the general public was opened in 1809, with many of the works of arts coming from demolished or deconsecrated churches in Northern Italy. In 1882, the Pinacoteca became independent from the Accademia and its collection grew considerably as a result of many donations. Nowadays, it is one of the most important and most impressive museums in Italy with an incredible collection of paintings. Napoleon as Mars the Peacemaker. 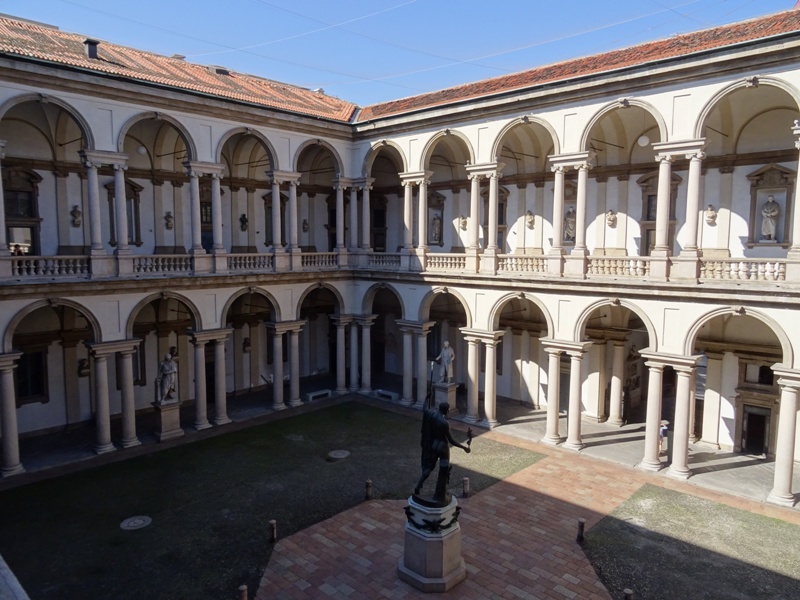 The lovely courtyard of the Palazzo Brera has a bronze copy of Napoleon as Mars the Peacemaker. The original is by the sculptor Antonio Canova (1757-1822) and can be found in Apsley House, London. The copy was made in 1811 and placed here in 1859. The courtyard is notable because of its double columns in the galleries and because of its fine double stairs which lead to the entrance of the museum. The museum has some 38 rooms, which makes it impossible to discuss all of the works of art or even all of the museum’s highlights. I will just mention my personal favourites and make a few comments about these paintings. This post will be quite picture-heavy, as there is no point in discussing paintings that I cannot show. Gentile da Fabriano (died 1427) was a painter from the Marche. He must have been quite famous, because he was summoned to Rome by Pope Martinus V (1417-1431), together with his pupil Pisanello (ca. 1395-1455) and his contemporary Masaccio (1401-1428). Gentile worked on frescoes in the Saint John Lateran, but died before the work was completed. Crucifixion – Gentile da Fabriano. The Pinacoteca di Brera has two interesting paintings by him. One is the so-called Polittico di Valle Romita (ca. 1410-1412), painted for a Franciscan hermitage in Valdisasso, near Gentile’s hometown of Fabriano. The polyptych – see the slideshow below – has a central panel showing the Coronation of the Virgin. This panel is flanked by large panels in the lower section, where Saint Jerome (with a miniature model of the church), Saint Franciscus, Saint Dominicus and Mary Magdalene are depicted. In the upper section of the polyptych we see four smaller panels with the martyrdom of Saint Peter of Verona, Saint John the Baptist praying in the desert, Saint Franciscus receiving the stigmata and a Franciscan saint reading. The Brera has another work by Gentile showing a Crucifixion. 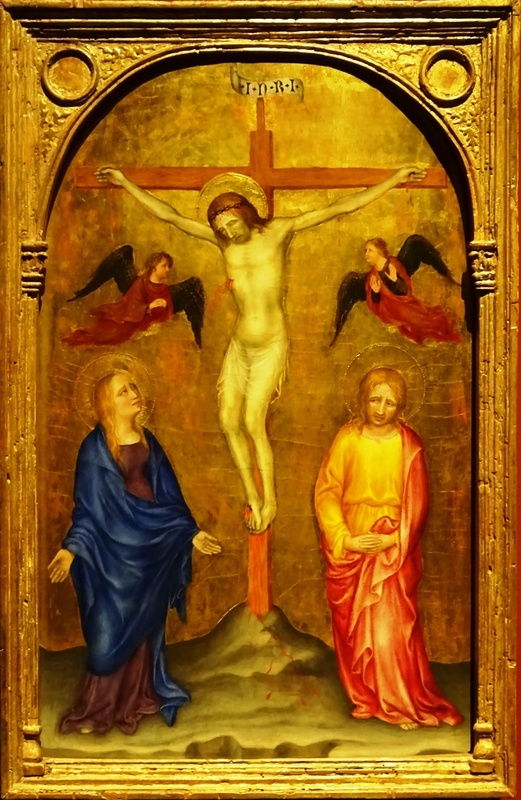 The crucified Christ is flanked by the Virgin Mary on the left and the disciple John on the right. Blood can be seen pouring from the wound in Jesus’ chest and there is also blood near the base of the cross. There is a theory – tempting, but unproven – that this Crucifixion was originally part of the Valle Romita polyptych, which is certainly possible. The polyptych was disassembled long ago and some parts of it may be missing. It is not in its original frame, with the current frame dating from the early twentieth century. Montefeltro Altarpiece – Piero della Francesca. Piero della Francesca (ca. 1415-1492) from Sansepolcro painted his famous altarpiece for Federico da Montefeltro, Duke of Urbino, in 1474. The balding Duke, a famous mercenary captain or condottiero, can be seen kneeling and praying on the right. He is wearing full plate armour. The Madonna and Child in the centre are flanked by – from left to right – Saint John the Baptist, Saint Bernardino of Siena, Saint Jerome (in his desert dress, beating himself with a stone), Saint Franciscus (showing his chest wound), Saint Peter of Verona (with a head wound) and finally Saint John the Evangelist (or Andrew the Apostle). Behind the protagonists are the archangels. The ostrich’s egg that can be seen hanging above the Virgin’s head is a symbol of both Creation and the Virgin’s Immaculate Conception. 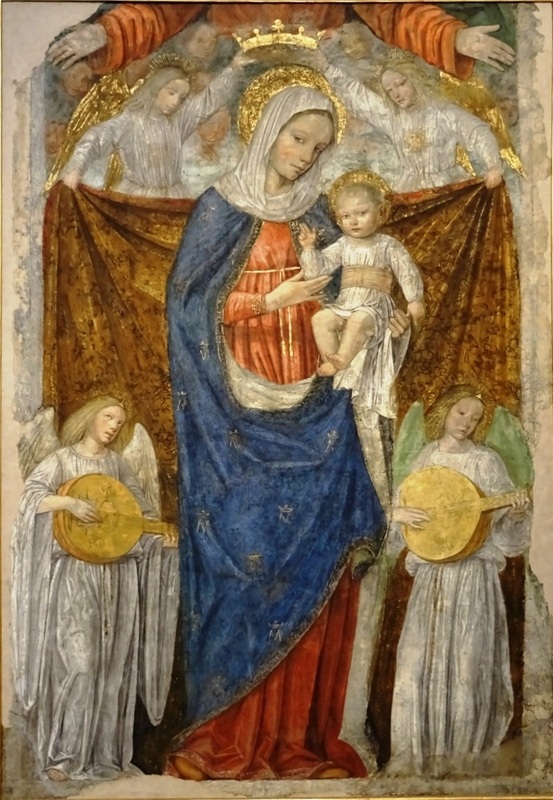 Benozzo Gozzoli (ca. 1421-1497) is of course best known for his frescoes in the Cappella dei Magi in the Palazzo Medici Riccardi in Florence. The Pinacoteca di Brera owns a small panel by him – 35 by 25 cm; see the slideshow below – which shows Saint Dominicus resurrecting the boy Napoleone Orsini, nephew of a cardinal, who has just been trampled by his horse. I did not know this story, but apparently it is quite famous in and around Milan. A similar scene can be found in the Castello Sforzesco. As far as I know, Gozzoli did not paint himself on the panel, something he was quite fond of, as he did it thrice in the Cappella dei Magi. Andrea Mantegna (ca. 1431-1506) was born in the Republic of Venice, near Padova, and it was for a chapel in the Abbey of Santa Giustina in Padova that he painted his famous San Luca altarpiece (ca. 1453-1454; see the slideshow below). The central figure in Mantegna’s large panel – 230 by 177 cm – is Saint Luke the Evangelist, no doubt working on his Gospel. The figures in the lower part of the altarpiece are all connected to the aforementioned Benedictine abbey in one way or another. They are – according to the relevant page on Wikipedia – Saint Scholastica (sister of Benedictus), Saint Prosdocimus (the first bishop of Padova), Saint Benedictus of Nursia and Saint Justina, a patron saint of Padova. Above Saint Luke we see a Pietà with the Virgin Mary and the disciple John. The other people are Saint Daniel of Padova (a deacon), Saint Jerome (again with a stone), either Saint Augustine or Saint Maximus (the second bishop of Padova) and Saint Sebastian. Christ at the Column – Bramante. But Mantegna’s best work was painted some twenty years later, when the painter had progressed considerably. I am referring to The Dead Christ and Three Mourners (ca. 1470-1474; see the slideshow above). The painting is very special, if only because of its use of extreme foreshortening, Christ’s horrible wounds and lifeless body, and the emotions of the mourners. The work may have been intended for Mantegna’s private devotion, since the painter presumably still possessed it when he died in 1506. When I visited the Pinacoteca in August 2016, the museum contrasted the painting with a similar work by Annibale Carracci (1560-1609). Carracci’s Corpse of Christ was on loan from the Staatsgalerie Stuttgart in Germany. It was obviously inspired by Mantegna’s painting and is at least as dramatic. I was pleasantly surprised by a painting of Christ at the Column by Donato Bramante (1444-1514). Bramante is primarily known as an architect, who for instance designed the Tempietto in Rome and was the first architect of New Saint Peter’s Basilica. He was also responsible for building the Chiostri Bramanteschi in Milan, the cloisters next to the Sant’Ambrogio. 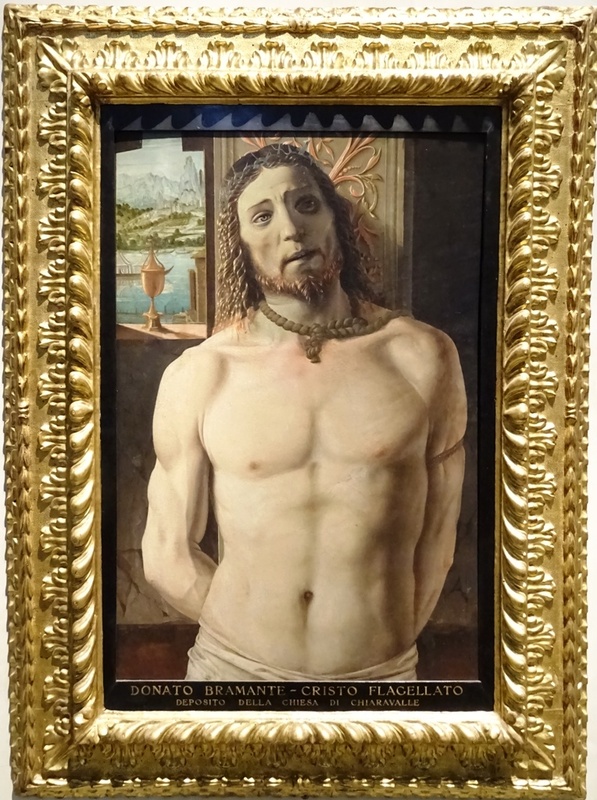 Apparently he was an accomplished painter as well (as were Leonardo da Vinci, Michelangelo and Bernini) and his painting of the tortured Christ is quite impressive. Christ has a rope tied around his neck and tears on his face (visible in the high resolution image on the museum’s website). The so-called Pala Sforzesca or Sforza altarpiece was painted in 1494 by an unknown artist, the Master of the Pala Sforzesca. 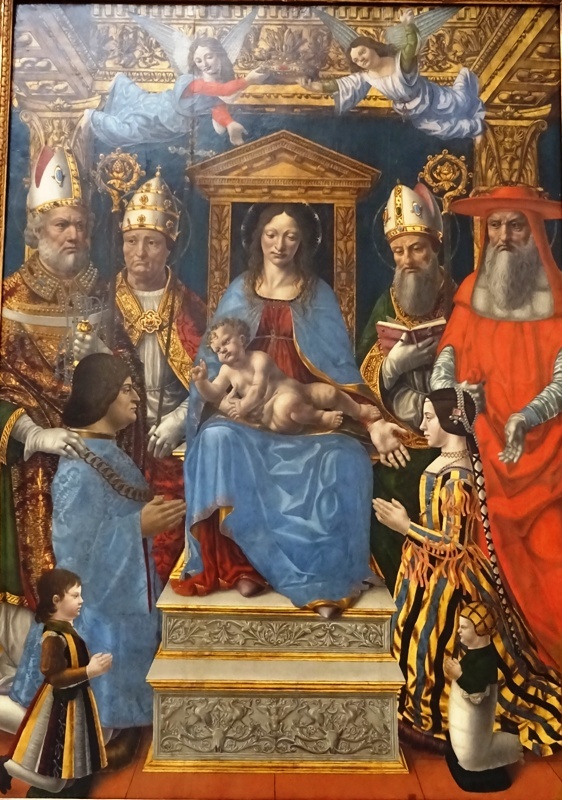 It shows Ludovico “Il Moro” Sforza (1452-1508), Duke of Milan, kneeling before the Madonna and Child. Also kneeling are his wife, Beatrice d’Este (1475-1497), and two of his children. The four Doctors of the Church are present as well. They are – from left to right – Saint Ambrosius (with his hand on Ludovico’s shoulder), Saint Gregory the Great, Saint Augustine and Saint Jerome. Beatrice d’Este died in childbirth aged 21; her son was stillborn. She had already born Ludovico two sons, Massimiliano (1493) and Francesco (1495). Massimiliano may be the boy kneeling on the left, but Francesco was probably not yet born when the painting was finished. It is not impossible that Massimiliano is actually the child on the right, while the slightly older child on the left is an illegitimate son named Cesare Sforza (1491). 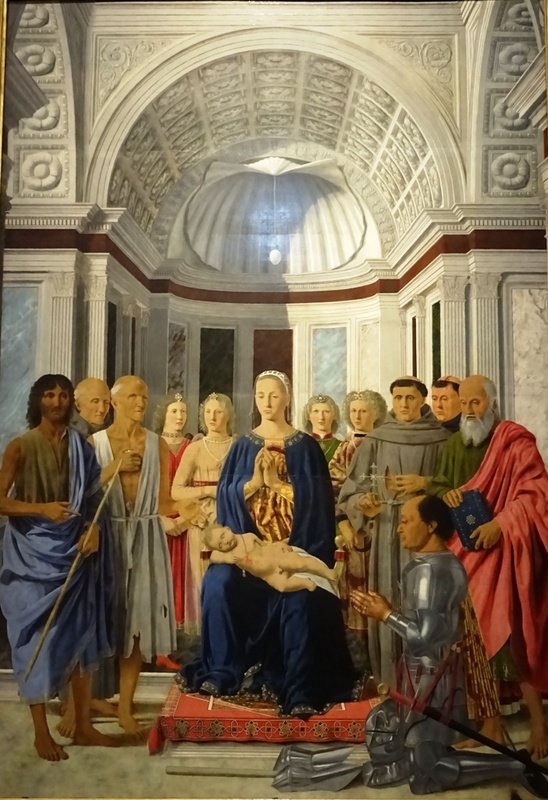 The Sforza altarpiece was, in a way, a piece of political propaganda. Ludovico had usurped the position of Duke of Milan from his nephew Gian Galeazzo Sforza and may have been involved in his death. He now tried to legitimise his position by portraying himself as a pious leader. The Marriage of the Virgin – Raphael. 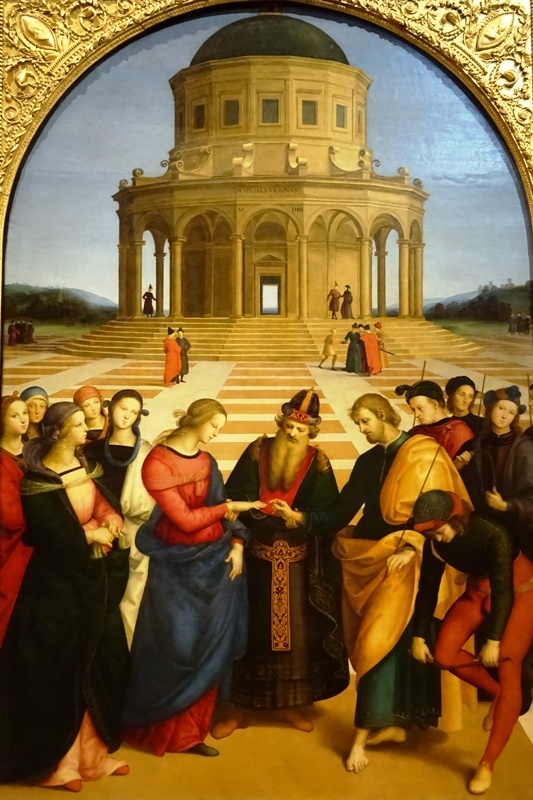 Raphael‘s The Marriage of the Virgin is another highlight in the Pinacoteca. Rafaello Sanzio (1483-1520) painted this work in 1504. This year – MDIIII in Roman numerals – can be seen on the temple in the background and Raphael signed the painting there as well: “Raphael Urbinas”, which refers to Urbino, the painter’s birthplace in the Marche. The painting was obviously inspired by a similar work by Raphael’s teacher Perugino. My travel guide claims that some experts believe that the boy breaking a stick on his knee is actually the painter himself. But since these experts are not named, this may just be an urban legend. Perhaps the largest painting in the museum is Saint Mark Preaching in a Square of Alexandria in Egypt by Gentile and Giovanni Bellini from Venice (see the slideshow below). It is truly immense, measuring 770 by 347 cm. The painting can be dated to 1504-1507 and was begun by Gentile, who died in 1507. His younger brother Giovanni then completed the work. It had been commissioned by the Confraternity of San Marco, whose building in Venice – the Scuola Grande di San Marco – was being rebuilt at that time, having been destroyed by a fire in 1485. Neither Gentile nor Giovanni ever visited Alexandria, but Gentile did work for the Ottoman sultan Mehmed II the Conqueror in Constantinople in 1479, which may account for the Islamic elements of the painting, for example the people in the crowd wearing turbans and the minarets. The most conspicuous participant in the whole scene is a giraffe. The animal can be seen on the right side, near the steps of the church. Jacopo Comin, known as Tintoretto (1518-1594), was a prolific painter who was also from Venice, like the Bellini brothers. His dramatic The Finding of the Body of Saint Mark, now in the Pinacoteca, was painted for the Scuola Grande di San Marco as well. The scene shows the Venetians opening tombs in search of the body of the saint, while Saint Mark himself appears on the left, commanding them to stop as his body has already been found: it is lying at his feet. The kneeling man in the orange robes is Tommaso Rangone, Guardian of the Scuola di San Marco and the man who commissioned the painting, which was executed between 1562 and 1566 together with another painting named Saint Mark’s Body Brought to Venice. The story of the Venetians snatching the body of the saint from Alexandria and taking it with them to Venice is told here. The Madonna and Child with God the Father and angels. The Pinacoteca has several paintings by Ambrogio Bergognone (died 1524). I had already seen one of his frescoes in the San Simpliciano in Milan and the upper part of his Coronation and Assumption of the Virgin in the Brera closely resembles that fresco. The work was painted in 1522, so it must be one of Bergognone’s last commissions before his death two years later. The two bishops in the scene can be identified as the Saints Augustine and Ambrosius. The Brera also possesses some earlier works by Bergognone. The Madonna and Child with God the Father and angels is actually a fresco that was later transferred to canvas. It was painted between 1488 and 1494. 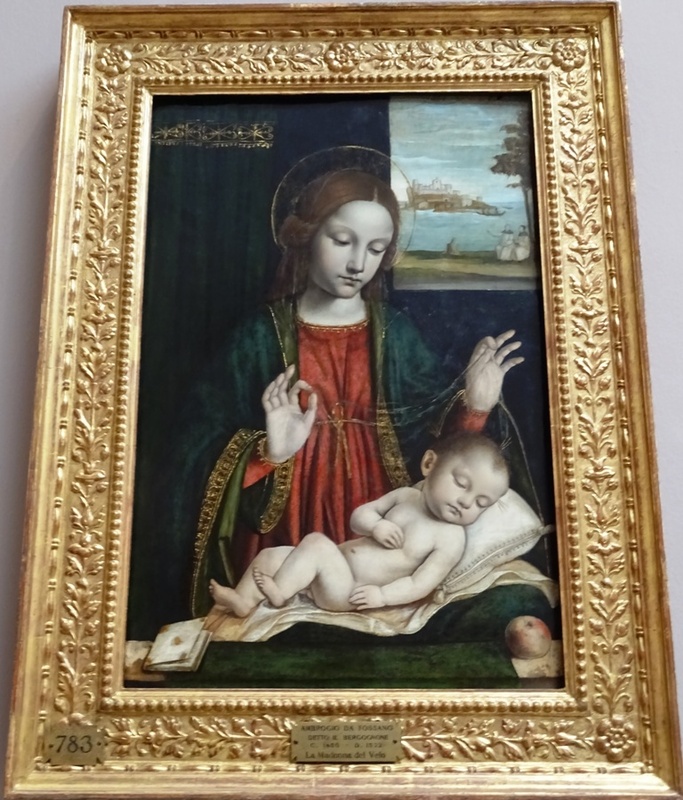 Some twenty years later the artist worked on the touching Madonna del Velo, painted somewhere between 1512 and 1515. The sleeping baby Jesus is quite moving and the apple to his right refers to the Original Sin, i.e. Eve’s mistake in Paradise. In the background we can see two monks of the Carthusian Order on the shore of a lake. 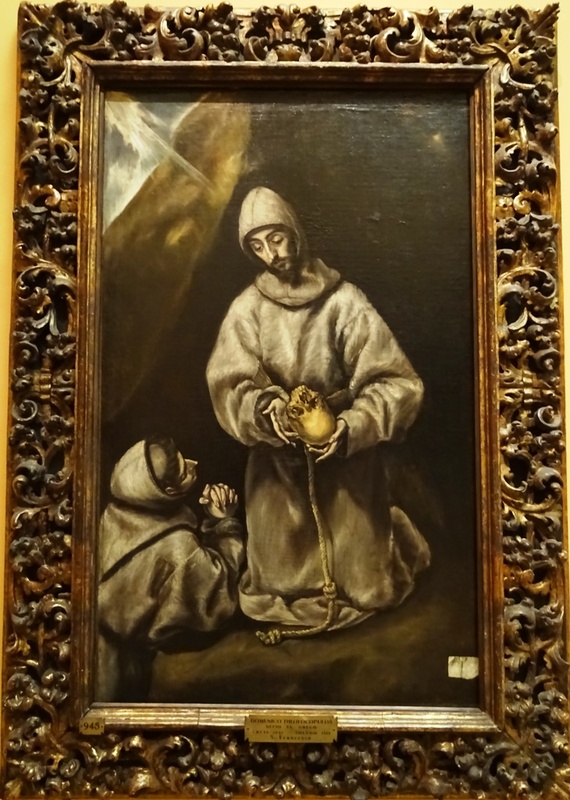 Saint Francis Meditating on Death – El Greco (workshop of). Caravaggio‘s Supper at Emmaus (see the slideshow above) must be among the museum’s most famous works, but it is also a relatively recent acquisition: it was part of a private collection until 1939. Caravaggio is actually a town in Lombardy; the painter’s real name was Michelangelo Merisi (1571-1610) but everybody calls him Caravaggio. Caravaggio painted his Supper between 1605 and 1606. The use of light and dark (chiaroscuro) is typical for Caravaggio’s work. The subject of the painting is taken from the Gospel of Luke. The resurrected Jesus meets two of his disciples on the road to Emmaus, a village near Jerusalem, but they do not recognise him. The disciples offer Jesus to have supper with them, and when the meal is served and Jesus breaks the bread, they suddenly recognise him. Caravaggio greatly influenced other painters, and the famous Dutch painter Rembrandt van Rijn (1606-1669) was one of those who borrowed much of Caravaggio’s style. The Pinacoteca possesses one work by Rembrandt, a small Portrait of a Girl, painted in 1632. See the slideshow above. The Brera museum also possesses one work by El Greco, the nickname of the Cretan painter Doménikos Theotokópoulos (1571-1614) who was born in Fodele or Heraklion. His Saint Francis Meditating on Death was painted between 1600 and 1610, and was probably not his own work, but executed by assistants in his workshop. The painting shows the saint kneeling, with a skull – the symbol of death – in his hands. The Kiss – Francesco Hayez. 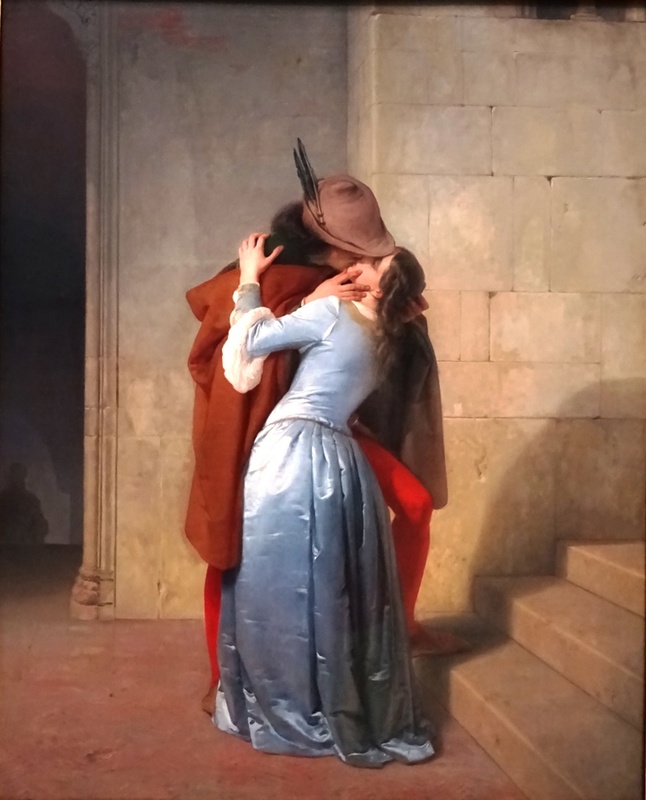 Among the other works in the Pinacoteca that I particularly liked are two paintings of locations in Venice by Canaletto (1697-1768) and the famous painting The Kiss by the Romantic painter Francesco Hayez (1791-1882), painted in 1859. 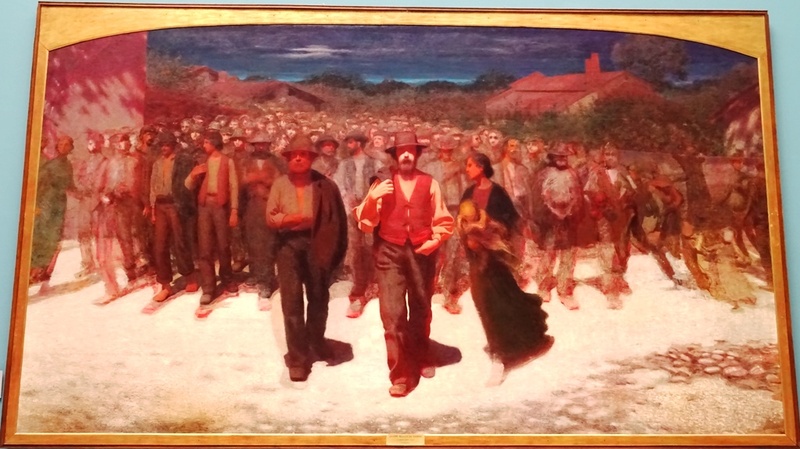 The Brera, which acquired the painting in 1886, bombastically calls it “the most widely reproduced Italian painting of the whole of the 19th century, created with the aim of symbolizing the love of the motherland and thirst for life on the part of the young nation that had emerged from the Second War of Independence and which now placed so many hopes in its new rulers”. The “young nation” is of course Italy, which emerged from a unification process known as the Risorgimento. The War of 1859 – the year The Kiss was painted – wrested Lombardy from Austrian control and greatly contributed to the unification. The most famous battle of this war took place at Solferino. The young Henry Dunant visited the battlefield afterwards and was so horrified by what he saw that he founded the International Red Cross four years later. I finally would like to single out Giuseppe Pellizza da Volpedo‘s huge Human Flood, painted in 1895-1896. The painting was not finished, and Pellizza da Volpedo went on to create a new and more famous version known as the Fourth Estate. Both paintings are about masses of labourers on strike. Human Flood – Giuseppe Pellizza da Volpedo.